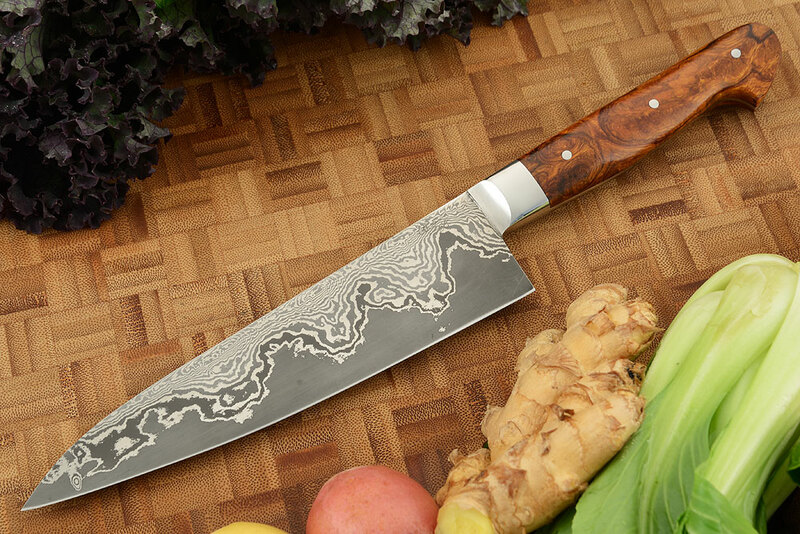 The long, deep-bellied blade is well suited for slicing vegetables and meats. The gentle arc of the cutting edge is perfect for a rocking, chopping motion with plenty of finger clearance over a cutting board. 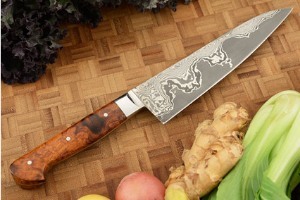 Because this knife is forged from carbon steels, we recommend using camellia oil after use to avoid rust and oxidation. The blade was hand forged in a technique known as san mai. A dramatic, stain resistant damascus is forged to the sides of a high performance 52100 carbon steel core. 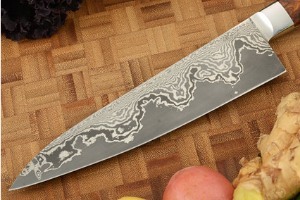 The bright, swirling pattern created from pure nickel and stainless steel is offset by the darkened carbon steel core. Many knifemakers and users feel that 52100 is among the best, if not the best steel currently used for knifemaking. The blade is triple quenched and triple tempered for optimal edge holding and durability. 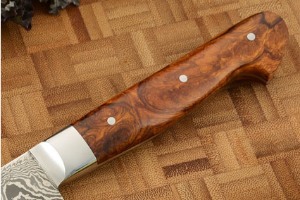 The handle is formed from presentation grade ironwood set on a distal tapered full tang. 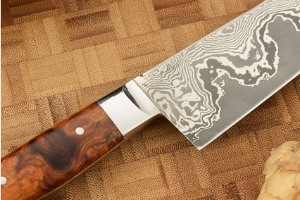 The swirling figure is well matched in both light and dark tones and adds a nice contrast to the complex damascus blade. It is nicely carved to swell at the palm, move into a slimmer waist and finally to swell again at the end of the handle. The bolster is formed by soldering 416 stainless steel to the blade and results in tremendous durability. 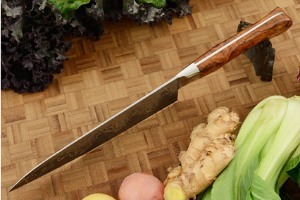 This knife has perfect balance and is sure to be your favorite knife in the kitchen!